NEW: We love younger trekkers – if you’re 35 or younger, claim your 20% discount using coupon code TMH-20 during registration. 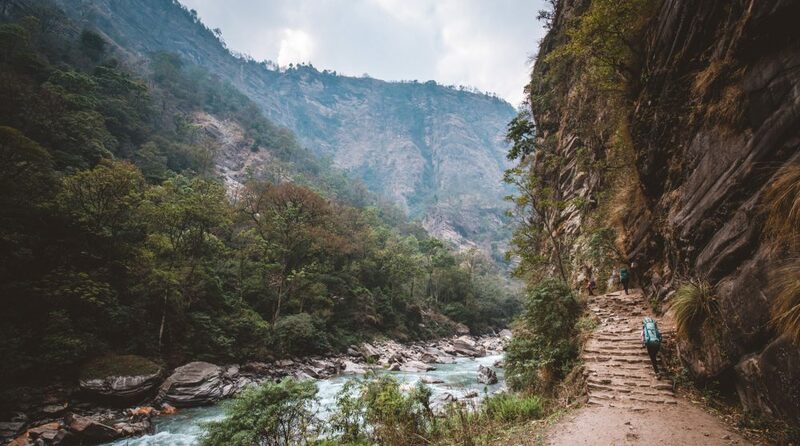 Starting in Nepal’s green lowlands, follow the roiling Budhi Gandaki River Valley up through its narrow gorges that by the by land us above treeline in the High Himalaya. As we go higher, we near the Tibet border and the local culture and religion slowly transforms from Hindu to Buddhist. 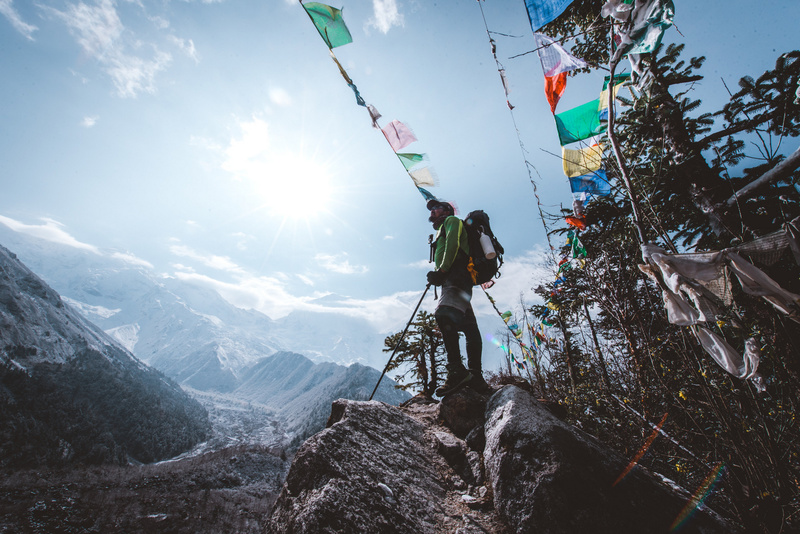 We’ll take a couple “rest” days up high using them to hike to Manaslu Base Camp and Tibetan Buddhist monasteries before crossing the Larkya La and rolling back down to civilization. 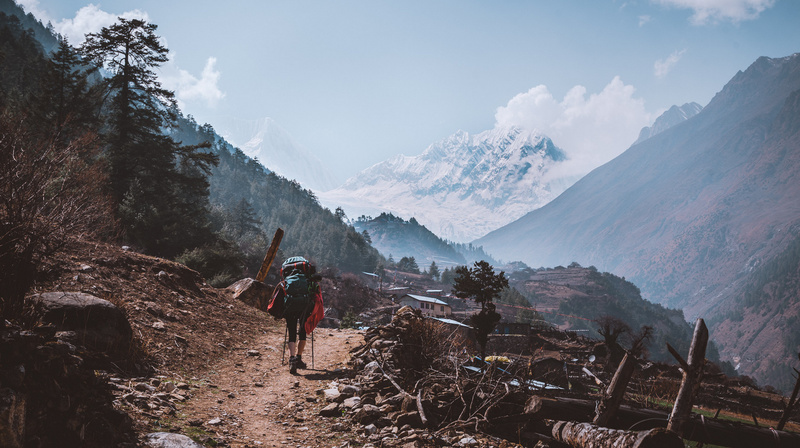 High ~ because the Manaslu Circuit hasn’t been around that long as a trekking destination, village and trail life is much more authentic Himalaya than tourist trek. 17,060f ~ 5,200m on the summit of the Larkya La, not as high as some of the passes on the Everest & Annapurna treks, but glaciated, alpine, and positively dramatic. Take your pick . . . trekking lowland gorges? monastery visits? 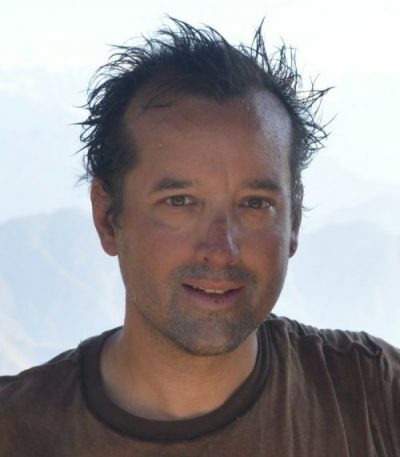 hiking the Tibet border and peering into Tibet? the Larkya La? New for 2018/19 . . . interest-free installment payment plans! We’re passionate about Himalayan adventures and strongly believe they’re game changers and should be accessible to all. Choose an installment plan or a traditional payment plan when you register. 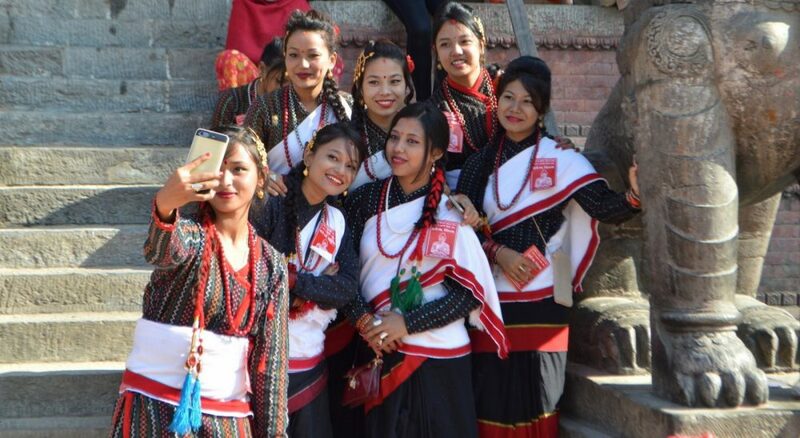 No country in the world welcomes thru-trekkers like Nepal. 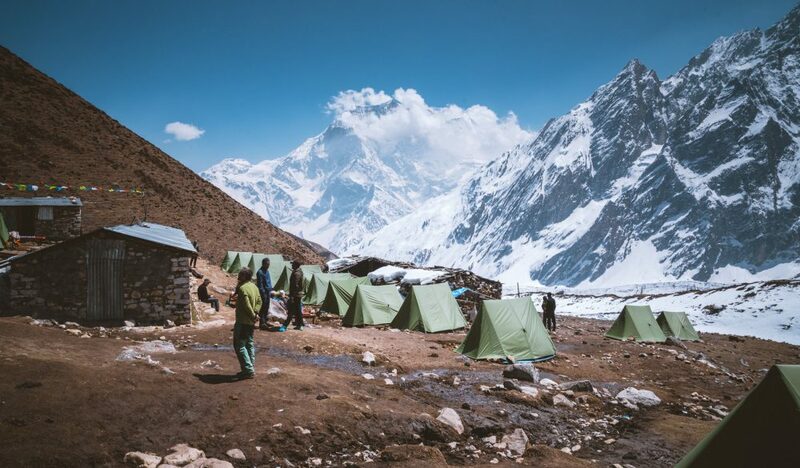 Its trails, sherpas, porters and villages provide access to high passes and massive mountains that would be no-go zones anywhere else. Our overnights will be spent in hospitable mountain lodges with private rooms, tasty menus, and the company of other trekkers from all over the world. 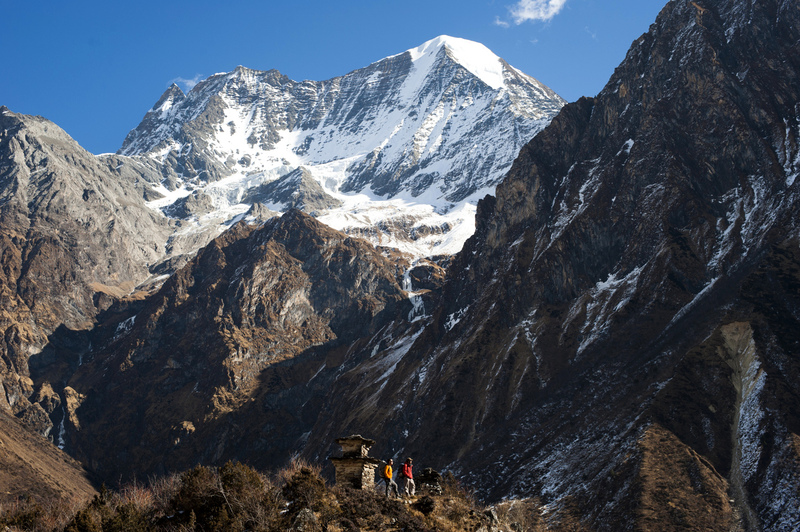 This is a fully supported trek with a fantastic crew of Sherpa guides and precocious porters . . . you’ll carry only a daypack with snacks and a few extra supplies each day. It’s your vacation! This leaves you with a simple task for the day – walk! 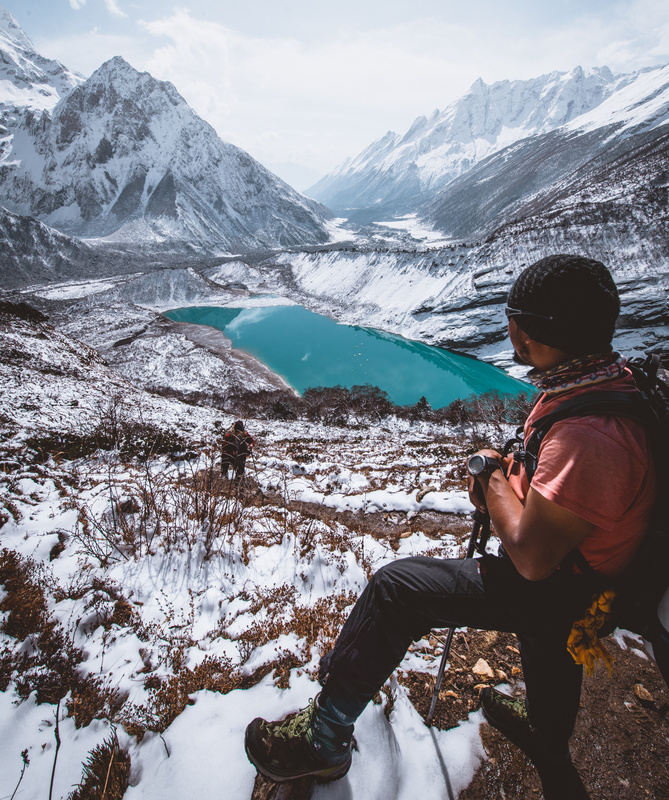 Dona Lake, formed by Manaslu’s melting glaciers, is at risk of breaking its natural dam and flooding the Marsyangdi Valley far below – we’ll drive through this area! 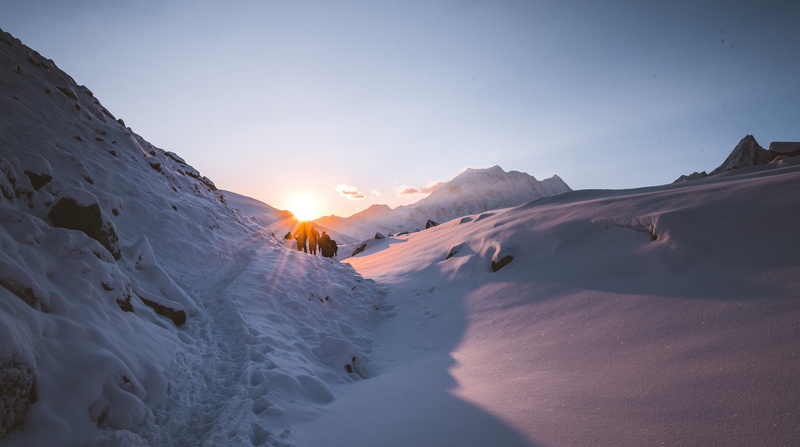 Because this trek leads us to high altitudes, we’ll take our time getting there, going up one day at a time, one step at a time to allow our bodies time to acclimatize. A nice bonus of this style is that we don’t have killer long days at elevation, well, at least in terms of mileage. Although your Tour doesn’t start until tomorrow in Kathmandu, you’ll need to begin your journey today (or yesterday, god forbid, for a few longer flights) to arrive tomorrow, if that makes any sense! Fly from North America to your layover city today; most major U.S. airports have high-quality, one-stop flights to Kathmandu, Nepal. While it’s not included in the Tour cost, Skychasers will arrange a group flight from Philadelphia or New York for those who would like to travel together. 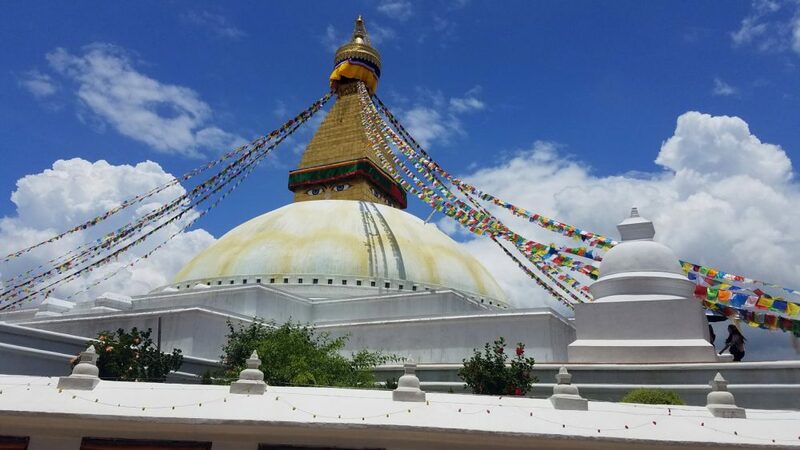 Upon arrival at Kathmandu’s Tribhuvan International Airport, those traveling on the group flight from the East Coast will be met by our driver who will take us directly to our hotel near Tibetan Buddhism’s holiest site in Nepal, the Boudha Stupa. 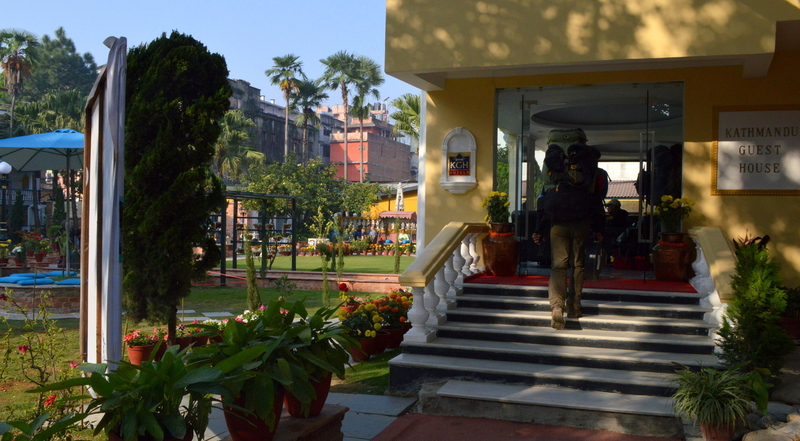 If arriving in Kathmandu independently, you will be met at the airport by myself or a member of our staff. Our tour begins this afternoon with hotel check-in followed by dinner. Airport transfer, dinner, hotel included. From our grand station overlooking the pilgrims circumambulating the Boudha Stupa, we enjoy a relaxed rooftop breakfast. After breakfast, we’ll give our hiking legs their first minor test by taking the 45-minute walk to Pashupatinath, the Hindu cremation ghats and temple complex. The area is also home to an immense amount of activity ranging from flying monkeys to ganja-smoking sadhus, Indian holy men. We’ll walk to the historic Dwarika’s Hotel for a late lunch or afternoon tea, as you wish, before returning to Boudha for free time and dinner. B/L/D, Pashupatinath entrance fee, hotel. No respectable visit to Nepal is complete without a road trip! We’ll get an efficient start this morning so that our drive may be leisurely and relaxed, characteristics that don’t necessarily go hand-in-hand with travel in this part of the world. As we top the pass on the rim of the Kathmandu Valley, brace yourself for the zigzaggedy downhill headed your way. A good part of the morning is spent winding along the Trisuli River and marveling at the colorful Indian trucks bringing goods in and out of Kathmandu. A northward turnoff begins our foray into the Himalaya and we take the paved road to its end near Arughat. From there we switch to a 4×4 to negotiate the final adventurous miles to our trailhead in Machha Khola, which translates to “Fish River”. We’ll check into our lodge, enjoy a walk around town and dinner, then retire for the night. 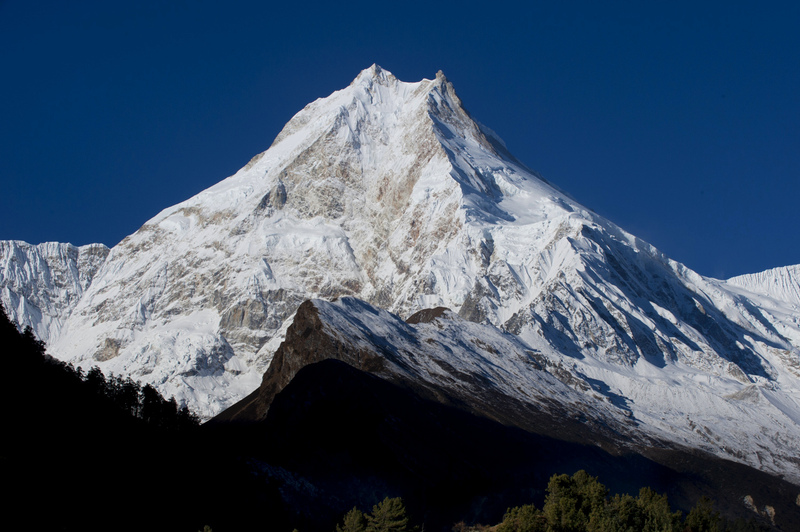 Private transfer, B/L/D, mountain lodge, Manaslu Restricted Area Permit, Manaslu Circuit Permit, Annapurna Conservation Area Permit all included. Energy defines the first day on the trail of any trek; maybe nervous energy, maybe potential energy, or possibly the thrill of the unknown. 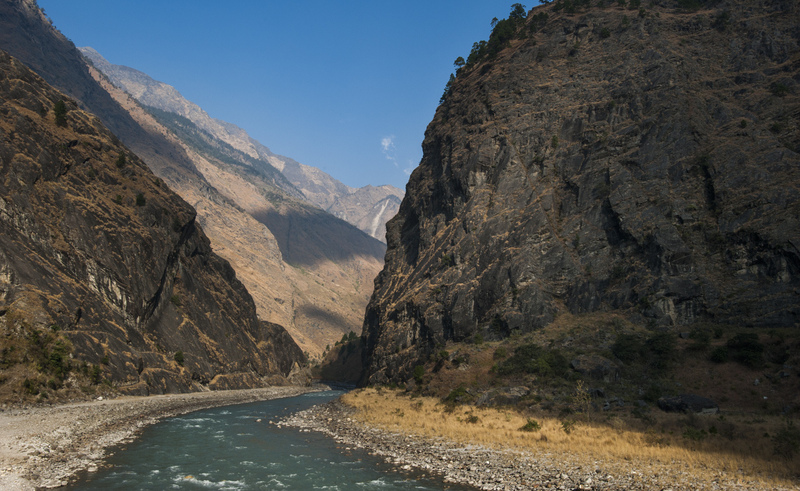 We set off headed upstream and above the Budhi Gandaki River, which stays with us for many days. We’re also introduced to the power of water as we see how the river has carved deep gorges as it relentlessly tries to find a way down and out of the Himalaya. Our trail has plenty of ups and downs today as it avoids cliffs and other steeps that stand in the way. The village of Tatopani (hot water) might be a great spot for a lunch break, usually a long, hearty affair. Continuing in the afternoon, we hike under the village of Dhoban then enter a remote stretch of uninhabited trail. Eventually, we stumble upon our destination of the day, Jagat, a respectable 1,500 ft. higher than our start in Maccha Khola. Call it an 11-mile day, so we should be ready to stop thanks also to the rugged trails and low elevation warmth. B/L/D, mountain lodge. A hearty, hot breakfast fuels our gentle riverside ascent northward out of Jagat. The jagged ridges running down to the river on our right lead up and up to the 23,000 ft peaks of the Ganesh Himal, but we’re so deep in the valley below that glimpses are fleeting. Presently, we encounter the village of Salleri sprawled on a tilted tableland not far above the river. Shortly after, the high mountains that signify the border with Tibet come into view dead ahead. Crossing the river on a long, swinging bridge, we’ll stop for tea break or lunch in the village of Philim, gorgeously perched among green pastures. The afternoon again lands us in uninhabited terrain although we’ll have views to villages far above us on the opposite riverbank. 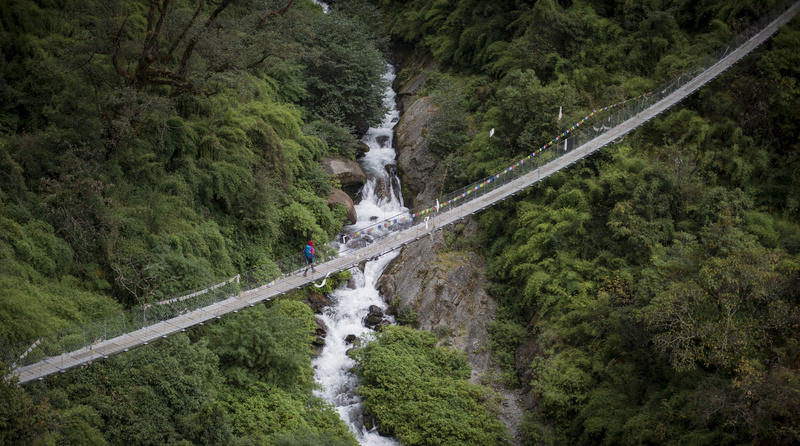 We’ll also pass by the entrance bridge to the Tsum Valley, a remote trekking destination that is more Tibet than Nepal. Crossing one last bridge over a side valley brings us to our final destination of Deng. B/L/D, mountain lodge. Today there’s a choice of two routes . . . the high route over the village of Kwak, or the normal route that sticks closer to the river. We can all go one route together, or split into two groups for part of the day. Our morning takes us through Bihi Bazaar, which is located at the junction of a rugged side valley leading to the Syarang Monastery 3,000 ft above us. A side trip to the monastery takes the better part of a day, so instead, we’ll continue up the Budhi Gandaki Valley, crossing the wooden bridge over the side valley. Soon after, the high route to Kwak detours off and up to our right and here we’ll split up, all go high, or all stay low. It’s unclear if there are any services in Kwak . . . make sure to carry everything you need to sustain yourself for a tough couple of hours. Kwak is about 2,500 ft above the main trail and provides the courageous hiker with the trek’s first real views of Mt. Manaslu. A few hours later, the Kwak route descends to the river, crossing a rickety bridge to meet up with the main trail. We’re now just shy of the Tibet border – we’ll pass a side valley that leads to a low 9,000 ft frontier crossing into Tibet less than four air miles away! Saving our Tibet border tour for later, we’ll stay with the main trail as we finish the day off with a forested final hour into Namrung. B/L/D, mountain lodge. The best adventures in the Himalaya are in the high country and today is the first in a series of days we’ve planned that caters to those of you who love to explore. To ease into altitude, our hikes become shorter and you’ll have time to rest, if you like. 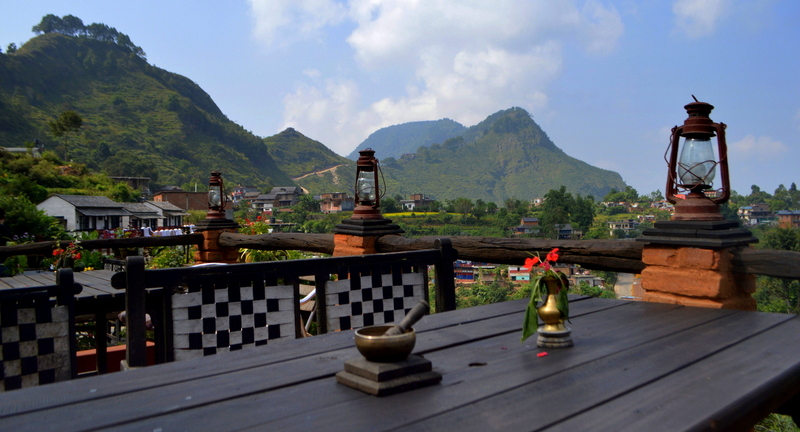 After a nice breakfast in Namrung, we’ll pack up our bags, stretch off the cobwebs from yesterday’s hike, and hit the trail with a minor, surprise, uphill for dessert of breakfast. Moving efficiently through the fields of Banjam and Lihi, we arrive at the junction of the alternate trail to Hinang Gompa (monastery). We should have plenty of time for the detour, which also happens to be the route to base camp of the 25,895 ft Himalchuli, and indeed, as we march upwards towards the monastery, the full bulk of Himalchuli and numerous other peaks slowly unfurl before our eyes. After lunch with a view at the monastery, we return to the main track as the valley begins to transition from deep gorge to open highlands. And, the people, landscape, and religion begin to look more like Tibet than Nepal. Lho is beautiful . . . as we roll into town, we’re treated to our first big views of Mt Manaslu. For even better views, head up to Lho’s monastery above the village for a sunset stroll. B/L/D, mountain lodge. Our path out of Lho winds us through village fields then underneath the monastery, before plunging down a cliff face to lose a quick 400 ft of hard-fought altitude. Never fear though . . . we’ll regain elevation gradually and by the time we make it to our tea break in Shyala, we’ll be 1,000 ft above our start in Lho. The good news is that between Shyala and our destination of Samagaon, there are a few ups and downs, but the bulk of our altitude gain is finished by tea break. The second part of our day is not particularly long, but many of us will now be feeling the altitude a bit. With time on our hands and remembering that we have plenty of Sherpas on our team who know the area, we’re free to split into a couple groups; pick your poison . . . (1) walk straight to Samagaon, relax (2) do an exploration hike up the opposite river bank to an unnamed viewpoint far above Samagaon, call it 3,500 ft above! (3) take a side trip to Pungyen Gompa, plunked in the middle of the glaciated valley directly below Manaslu and Himalchuli. B/L/D, mountain lodge. While Everest’s base camp is on the bumpy but relatively level Khumbu Glacier, the Manaslu Base Camp is perched precariously and dramatically high above Samagaon and the turquoise waters of Birendra Lake. Surrounded by glaciers tumbling down Manaslu’s walls, base camp is located on a tongue of rock and dirt that extends high onto the mountain. To be clear, today’s hike is entirely optional, so anyone who prefers to hang out in Samagaon for the day is more than welcome to do so. 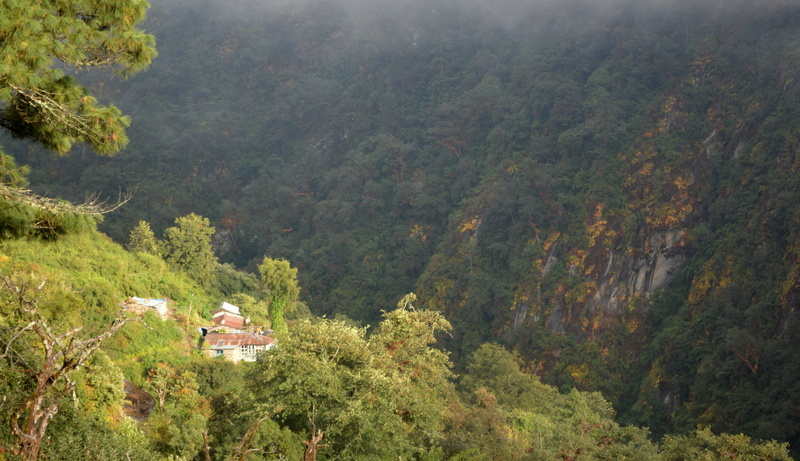 Starting in the valley, the hike begins sleepily with a walk to the foot of the climb alongside Birendra Lake. Once the path reaches the mountain, it quickly moves upward with intent, steeply at times. Looking back, we can see across the valley the peak of Pangpoche move into view, just inside the Tibet border. Passing the rock face above Birendra, we sidle up to the glaciers of Manaslu zigzagging upwards where the terrain is exceptionally steep. The last spectacular section rises upward along an exposed dirt ridge that leads us to base camp. We’ll spend some time there, eating a packed lunch, regrouping, and enjoying our alpine situation before beginning the descent. Call it four or five hours up, three down. B/L/D, mountain lodge. One of the nice things about hiking at altitude is that, to keep within altitude gain limitations, hiking days between destinations tend to be shorter side. Today is a straightforward five or six miles (8 – 10 kms). After our stiff base camp hike yesterday, we’ve earned a slow, leisurely breakfast, taking as much time as we need to get on the road. Our path stays mercifully on the valley floor most of the way, slowly gaining altitude and moving in and out of yak pastures along the way. Keeping the rolling river on our right, we trek underneath Birendra Lake and won’t run into a real village again until we reach our destination. 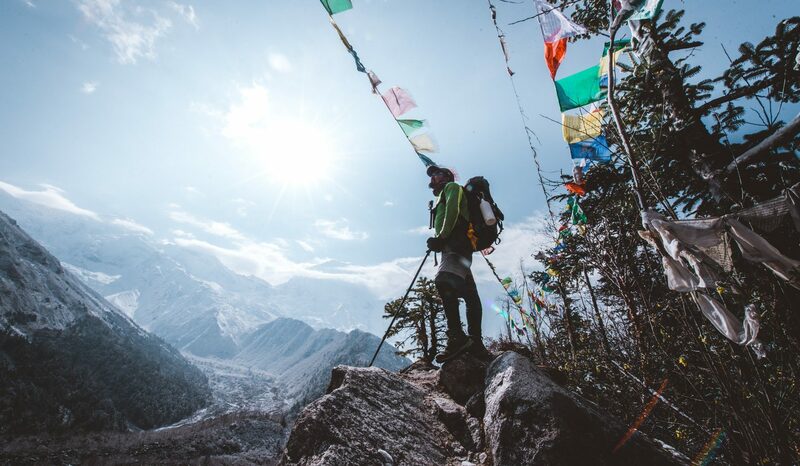 Crossing the river and walking northwards, our world opens up onto the rocky summits of the Tibet border and the Lajyung Bhanjang, a hidden pass into Tibet. We should be in Samdo with plenty of time to spare, so you’ll have time to walk the village, do laundry, or target a mini summit for sunset. B/L/D, mountain lodge. The high Himalayan border areas between Tibet and Nepal have traditionally been fluid zones where locals can come and go as they please. This is slowly tightening with some border areas now being closed or at least tightly controlled. However, yak trains and other local travelers are still free to fly back and forth over the frontier as of this writing, at least at the Rui La Pass. It’s not every day that you get the chance to walk to the Tibet border, but today is one of those days! We’ll order packed lunches of yak cheese, boiled eggs, and Tibetan bread the night before so we can get an early start this morning. It’s an all-day hike to the Rui La and, surprise, it’s all uphill, but because the track’s been in existence for centuries, it’s not overly rugged for this altitude. Even though we’re at the ends of the earth, there are still plenty of signs of life with yak pastures and kharkas (shelters for herders) scattered along the route. A couple hours in, we’ll reach the glacial moraine signifying the end of the ice oozing off the Panbari Himal 9 miles dead ahead and a mile and a half above. We’ll veer right here into the final upward-leaning canyon leading to the pass from where we’ll have an endless panorama into the arid mountainscape of Tibet. B/L/D, mountain lodge. Sticking with our theme of one easy day, one hard day, we’re on track for an easy day today, well, our mileage will at least be short. Starting off slowly, we’ll stick to the true left (north) side of the river and within an hour, we’ll stumble upon the minuscule village of Larkya Bazaar. If you like, take a short break here before continuing upward, traversing onto the side of the hill which is now one valley away from Tibet. Again there are no lodges along our route, so we’ll wait until we arrive at Dharmasala to eat lunch, surviving on granola bars and beef jerky. After lunch, we’ll again have free time . . . those of you who haven’t had enough of a workout are welcome to explore the “hill” above the village which tops out above 18,000 ft. Or not. B/L/D, mountain lodge. 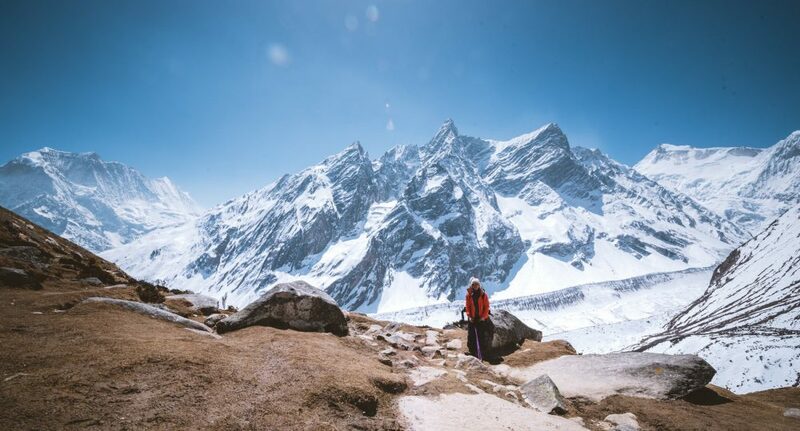 Trekkers, for a summit day in the Himalaya, your vertical gain on the hike to Larkya La is a very humane 2,600 ft; even better, it’s a stunning alpine walk as we ascend initially alongside the Larkya Glacier before crossing its remnants later on. 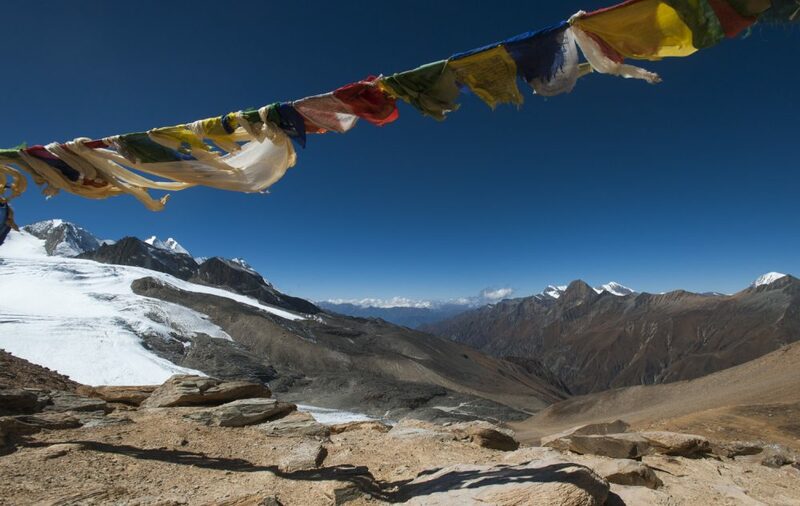 Lonely Planet calls the Larkya La one of the most dramatic high passes in the Himalaya. One of the best things about crossing a high pass is being rewarded with an entirely new vista. On the Larkya summit, we’ll enjoy brand new views into the Annapurna range and the 7,000-meter peaks that tower above the NarPhu Valley. If the weather’s nice and the winds are calm, we can partake of our packed lunches on top of the pass, otherwise, we’ll head down a bit to eat. As with our other high-altitude days, we’ll enjoy the company of other trekkers and yaks, but otherwise, we’re staying remote with nary a village in sight. Our descent is a big one, landing us in the village of Bhimtang, almost a vertical mile below the top of the pass. B/L/D, mountain lodge. We’re getting after it today . . . after many days of low mileage due to challenging, high altitude routes, it’s time to finish off the descent and make it to the “road” in Dharapani. We start in high, alpine territory and finish in the sub-tropical jungle of Nepal’s middle hills. Going down, down, down, even though we’re still in the midst of the high mountains, we’ll lose sight of many of their snowy summits. We’re finally back in civilization and we’ll walk through a number of villages today which will go by in a blur, the largest of which is Tilje, an hour or so before we arrive in Dharapani. Dharapani is at the intersection of the Annapurna and Manaslu treks and brings with it more luxurious lodges, warmth, and tastier food. Enjoy your last night in the mountains! B/L/D, mountain lodge. We could make it the whole way back to Kathmandu today, but it’s a sickeningly long drive and we’d miss out on the beautiful, old trading post of Bandipur. Our Sherpas will arrange a 4×4 or two the night before and we’ll be ready to roll in the morning. The adventure truly never ends in Nepal and indeed, our first couple hours are on unpaved roads through stunning and rugged green mountains. Arriving at the traditional start of the Annapurna Circuit and the paved road, we’ll switch to a larger, smoother Hiace van in the bustling town of Besi Sahar. A couple more hours of enjoying being transported by something other than our legs brings us to the high hills of Bandipur and our well-earned, comfortable hotel. Bandipur is an old, gorgeous village situated in the saddle between two tall hills. We’re there for the cobbled walking streets, Himalayan views, walks above town, delicious food, showers . . . B/L/D, boutique hotel. After a long breakfast at our Bandipur hotel, we’re back in the van, winding down the Bandipur hill, turning right to the cracked out truck stop town of Mugling, and finishing off our drive into Kathmandu along the Trisuli River. It’s always nice to be back in the big city with big services . . . we’re headed to Kathmandu’s tourist center of Thamel where we’ll check into the legendary Kathmandu Guest House. Enjoy your free afternoon walking the streets of endless shopping, relaxing in a cafe, showering, or calling home. In the early evening, we’re off to the Monkey Temple, below, taking on its 365 steps to the glorious stupa on top overlooking the Kathmandu Valley. This shrine displays a phenomenal mix of Tibetan Buddhism from the north and Indian Hinduism from the south meeting and mixing in Kathmandu. Oh yeah, there are monkeys too and they’re endlessly entertaining. We’ll finish off our day back in Thamel with a nice farewell dinner. B/L/D, Swoyambhu entrance fee, hotel. Most international flights depart Kathmandu in the afternoon or evening, and, we’ve only just scratched the surface of this ancient city, so we’ll continue with the best the city has to offer – with a little crazy thrown in. Breakfast will be in the hotel garden and will be long and leisurely as we continue to try to nip the trekking calorie burn in the bud. Following will be a morning of relaxation with plenty of time for shopping on your own amid a smorgasbord of colorful Himalayan arts and crafts just outside the hotel gate. From there we’ll walk into the very heart of old town Kathmandu just to test each and every one of our five senses. Depending on your flight time, we’ll have lunch and a light dinner before heading off to the airport. B/L/D, Durbar Square entrance fee, airport transfer. With any luck, you’ll finish off your flight today, arrive at your hometown airport and be sleeping in your own bed tonight! Logistics, Registration, Etc . . .
Reserve your spot on the trip by clicking the button below, entering your information, and making your trip deposit, either by credit card or check. New for 2018/19 . . . interest-free installments! Manaslu’s lodges are comfortable and basic with small, private rooms for two, warm dining rooms heated with yak dung stoves in the evenings. They’re a very big step up from camping! Lodge kitchens prepare delicious, powerful meals that aid our recovery and fuel our hikes. There are often pay charging stations and showers available, although hot water can be hit or miss. Meals are served up communally in the dining room with a menu that’s extensive enough to accommodate a wide range of food sensitivities. Wifi is sometimes available, although it can take some coaxing to do what needs to be done. So, you’re not a professional hiker? No problem! You carry only a daypack, not a big backpack . . . our precocious porters do the heavy lifting, transporting your big backpack or duffel bag to the next mountain lodge. There’s no camping on this trek . . . all nights are spent in mountain lodges. Show up with a mediocre amount of fitness, suffer a bit the first few days, then watch in amazement as your body rises to the challenge and you end up in the best shape of your life! Alternate routes and potential rest days at high elevation give us an out for anyone who, for whatever reason, may not be feeling up to the task of tackling some of the more difficult days. This trek is designed for anyone who wants to get up-close and personal with the Himalaya and can commit to conditioning work (cardio) to make it happen. Know Before You Go. Read our Terms & Conditions . . .